Dr. Filali’s philosophy is to treat every patient with VIP care. In order to do so, his office was designed in collaboration with renowned architects to create an atmosphere of serenity and calmness. The space is also comfortable, luxurious, and reminiscent of a rooftop atelier. Dr. Filali aims to “take the pain out of dentistry” and thinks of his practice as an oral health and dental wellness center. 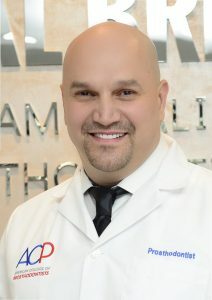 Dr. Filali completed his degree in General Dentistry in 1996, followed by three years of intensive training in the study of Prosthodontics, the discipline focusing in full mouth rehabilitation. This field of dentistry pays special attention to the esthetic appearance and clinical reconstruction of the mouth. Dr. Filali received his Prosthodontic specialty training at the highly esteemed and prestigious Boston University Henry M. Goldman School of Dental Medicine in 2009. Pursuing his specialized interests, he continued his education by acquiring numerous certifications and credentials in this field. Dr. Filali is the recipient of multiple accolades, including awards in dental research and clinical expertise. He is also fluent in English, Arabic, and French. In his spare time, Dr. Filali enjoys traveling and assisting those with no access to dental care in international settings, most recently in Guatemala. Dr. Kanasi is a caring and highly specialized Board Certified Periodontist with an impressive background in dentistry and Periodontology. She received her dental degree (DDS) from Sweden in 2003. Her education continued in Boston, where with the support of the National Institutes of Health (T32) she received a Master’s of Science (MS) degree in Epidemiology from Harvard School of Public Health in 2006 and a Certificate in Oral Epidemiology from Harvard School of Dental Medicine in 2007. In 2008, Dr. Kanasi completed her Doctor of Philosophy (PhD) in Oral Microbiology, a collaborative program between the Forsyth Institute in Boston and Umea University in Sweden. Her thesis focused on the bacterial identification of initial periodontal disease and rampant childhood caries. Dr. Eleni Kanasi was also the active Periodontist at Whittier Street Dental Health Center (2013-2016) and practiced Periodontology at the Faculty Practice of Boston University until 2016. Serving two different populations (the underserved and the one with access to care) gave a different perspective in her life and has led Dr. Kanasi to give back to the community and children through Early Head Start programs and as the Team Smiles organizer in the 2016 Yankee Conference. Dr. Olga Spivak graduated with Honors from Boston University School of Dental Medicine where she received her DMD degree. She also holds her bachelor of science degree and DDS degree form Saint- Petersburg State Medical University, Russia. Throughout her career path her passion has been esthetics dentistry and orthodontics. Upon her graduation from Boston University she received the Hanau Excellence in Prosthodontics Award “Best of the Best Award”. She is an Invisalign certificated dentist with affinity for dental innovation and CEREC training. Dr. Spivak has been an active member of the community and enjoys giving back to people. She is a member of the American Dental Association (ADA), Massachusetts Dental Society (MDS) and Alpha Omega Dental Fraternity where she constantly participates in continuing education courses to enhance her knowledge and training. Dr. Spivak holds a personal passion to deliver conservative and aesthetic restorations to achieve an emotional closure and patient’s satisfaction with the treatment.